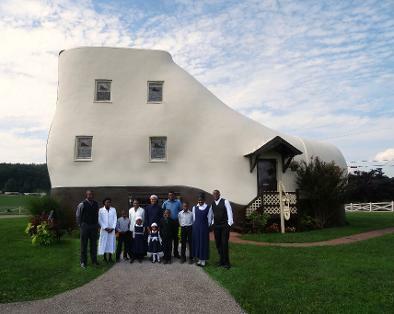 Find out more about the Haines Shoe House HERE or better yet, take a tour and and enjoy the sweet treats and ice cream in the sole of the shoe . . . we did! "I wish I could've read Color Struck by a fireplace because you escape right into the book when "listening" to Grandma Bell tell her story. This was one of the most emotionally-charged books I've read." 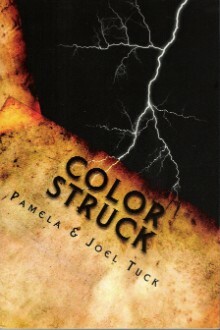 "The Tucks have brought a story of healing and forgiving. I recommend this book for young adults. They will get to learn a little of how African Americans struggled within their own community. And see how far we have come and hopefully not repeat the same mistakes." As a mother of 11 children, I’ve often been asked, “How do you do it?” and told, “You should write a book.” The thought was amusing, but I honestly didn’t think a story about my family would be very interesting. At least not until I joined a 30-day picture book idea challenge in November 2013. I sat in the high school parking lot, waiting for one of my sons (just one of my many tasks for that day). I told my husband, Joel, that I felt like the old woman who lived in a shoe. He replied, “Why don’t you write about the young woman who lives in a shoe.” I really think he was being sarcastic, but I jotted the idea down for day #12 in my journal. At the end of my challenge, I had 30 story ideas, but not 1 single story written. As another attempt to spark my writing inspiration, I joined a rhyming picture book group on April 1, 2014. What a challenge! Not only did I have to come up with a story, but now it had to rhyme. As I skimmed through the story ideas in my journal, entry #12 was the best choice. I’d simply have to write a spin-off to the nursery rhyme. Easy, right? Wrong! The first draft I submitted to my group was a sweet little rhyme, displaying a perfect little family. It was ripped apart by one of my critique group members. It hurt, but it certainly sparked my writing fire. I read over the comments and said to myself, “You want reality? I’ll give you reality.” My next draft held the raw truths of a day in the life of the Tuck family, and Mother of Many was born. Little did I know that I would lose my dear husband and friend on November 11, 2014, only 1 day from being exactly 1 year from the day he suggested to write the story. I’m so glad I listened to the questions of “How do you do it?” and answered the requests for me to write a book about my family . . . in doing so, this story of our simple daily activities and antics preserves the wonderful memories we shared as a happy family of 13. The idea for this story came from my father’s personal experience. Belonging to a family of civil rights activists, surrounded me with many stories of pride, oppositions, and triumph. The inspiration to turn a snippet of my father’s story into a picture book was initiated by my husband, Joel. In listening to my father tell his story over and over, his determination to excel always overshadowed his oppositions. Although he mentioned his fears and his feelings of isolation, his confidence kept him from wavering. He held his own personal pep rally, by telling himself, “I can do this.” At first, I didn’t think I could give my father’s story justice as a picture book, and my husband became my personal cheerleader by telling me, “You can do it.” It’s ironic how the same willpower that enabled my father to surpass his doubts, also allowed me to surpass mine. 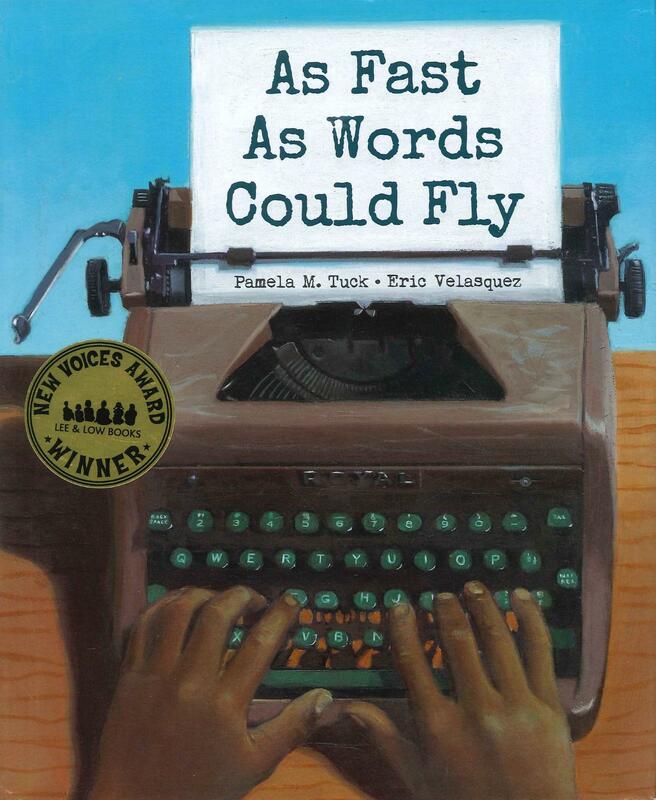 I reluctantly took the challenge to write my father's story, submitted it to Lee & Low Books, and to my wonderful surprise, I received the New Voices Award. 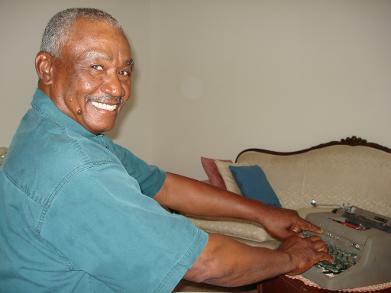 My dad, Moses Teel, Jr., with a Royal typewriter. He still prefers typewriters over computers! I was inspired to write this novel after hearing the Cinderella-like life of our Grandma Doll. After three years of writing this novel, I hope that it will touch the hearts of the readers, just as it has touched mine. I invite you to journey with the Steele family, as they seek to find the truth behind their family's strength and truly bury the trouble that slowly creeps from the grave. Before you plunge into their lives, ask yourself these questions: Is what you see, really what you get? Is a person really on the inside what they portray on the outside? Where does a family's strength lie? All these questions, along with the revealing of a well-hidden family secret are answered within the pages of this novel...so don't delay...brace yourself, and enter into the world of the Steele Family. Want it as an ebook? 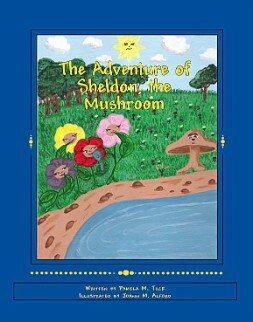 THE ADVENTURE OF SHELDON,THE MUSHROOM? I was inspired to write this story after a family night of storytelling. In an attempt to be "creative", we decided to tell stories "off the top of our heads". I listened as everyone told their "silly" stories and at last, it was my turn to take the floor. A lonely little mushroom character had already popped into my mind, but how was I going to tell his story? As I began speaking, Sheldon's story unfolded and captivated the minds of my family. After several years, Sheldon wouldn't let us rest, until others knew his story, too. With vibrant illustrations by Joann M. Alford, and lively songs to entertain children of all ages, we invite you to meet our "family friend, Sheldon"...we can almost guarantee, you'll love him as much as we do.